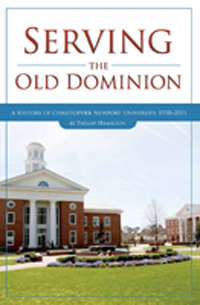 Serving the Old Dominion: A History of Christopher Newport University tells the story of Virginia’s youngest state university during the late-twentieth and early-twenty-first centuries. Opened in 1961 in Newport News as a commuter school with 170 students, Christopher Newport University (CNU) today is a highly selective residential college serving 5,000 students from across the state and is a vital part of life on the Virginia Peninsula. Placing the university’s development into the larger context of American higher education, Phillip Hamilton narrates CNU’s growth and evolution across five decades. In 1958, Hampton Roads leaders initiated discussions with state officials to create a commuter college on the Peninsula to serve both working adults and the “baby-boom” generation. Initially a two-year branch of the College of William and Mary, CNU quickly established a tradition of excellent teaching led by a dedicated faculty. In the mid-1990s, changes in higher education (particularly the advent of online education) caused CNU to experience declining enrollments and budget cuts. Amid these difficulties, former US Senator Paul Trible became CNU’s fifth president. Under his leadership, the university dramatically changed direction. Building upon its reputation for exceptional teaching, Trible turned the school into a residential college and recruited highly talented students from throughout the Old Dominion. Initiation of a $500 million building campaign transformed both the campus and student life. Thus, by the end of the new millennium’s first decade, CNU was a thriving and important academic institution within Virginia.